FYI: This is a sponsored post, so keep reading to get your special discount code! If you haven’t already noticed, STEAM (or STEM) has really become a hot, trending topic that has made its way into many school, after-school, and homeschooling curricular programs. Even stores that carry educational products have an aisle dedicated to STEM (STEAM is now beginning to gain popularity.) labeled activities. 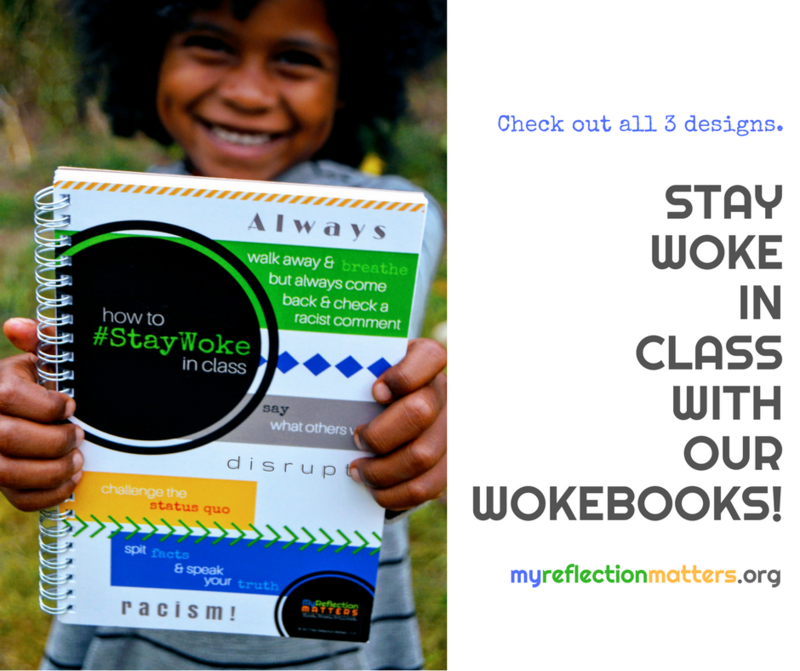 While I totally love the concept of having children explore STEAM concepts through hands on projects in real time (Which, by the way, was my high school’s robotics team, so this isn’t really a new idea–it’s just packaged differently…but, I digress. ), it’s very frustrating to still see the packaging of so many dope STEAM/STEM products include primarily White (male) faces and even more infuriating to still see White, male, scientists dominate the STEAM dialogue on television, the inter-web, and in books. I ain’t got nothing against White men…well, at least not the ones who actively engage in dismantling White supremacy and patriarchy and, well…the list truly can go on, but that’s not the point here. Actually. It kinda is. For a while I’ve been contemplating on purchasing a monthly STEAM subscription box for my four and six year old sons who love to build and pull things apart. So, when I finally came across Dream In Steam I was ecstatic for two reasons. 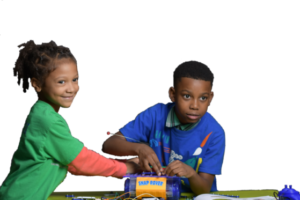 The first thing that immediately stood out for me was the heavy presence of melanated young people pictured all over their website’s homepage building towers and looking like little scientists. 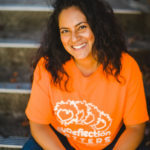 For people who see themselves represented everywhere all of the time, this may not sound like a big deal, but it is for those of us whose image is often left out–especially when it comes to academic related themes. Second, Dream In Steam is the brainchild of Aquarius Cain–a Black. female science teacher and homeschooling mother. Aquarius created a homeschool STEAM Club and provides STEAM workshops for an after school program in her local community. 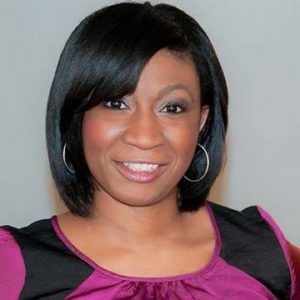 She also runs her own tutoring company, Achieve Success Tutoring, in Dallas, Georgia. 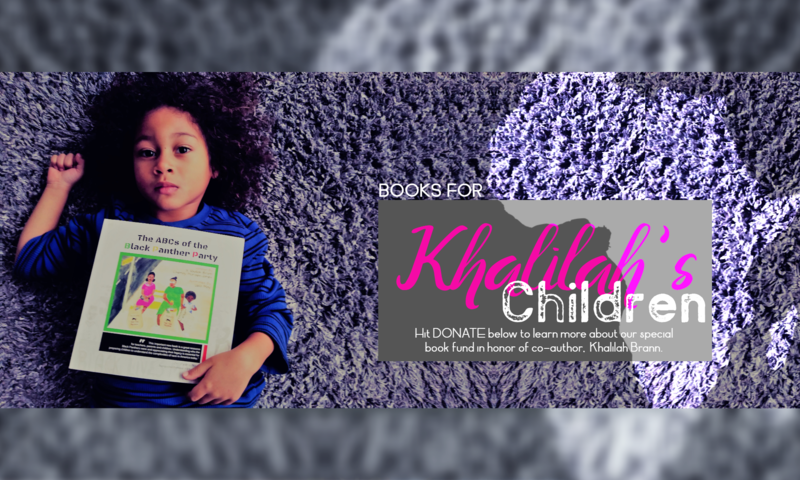 It is through her work that she decided to extend her love and knowledge of everything STEAM with others outside her home town by putting together a monthly STEAM subscription box for kids and their families to explore together. What’s there not to love about Aquarius, right? 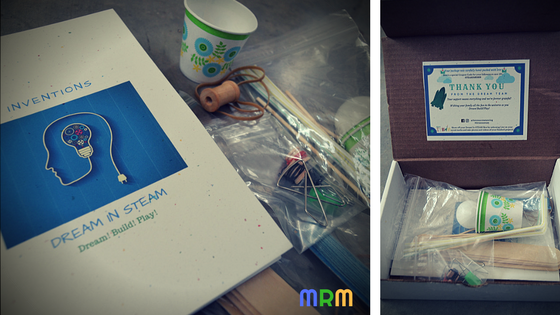 My first Dream In Steam box came with four zip locked projects (It’s a perfect number for kids to choose one project a week each month.) and a booklet containing helpful tips for each hands-on activity. Each activity is labeled with the name of the invention students are expected to build only utilizing the materials provided in their zip lock bag. Students’ critical thinking skills are put into practice and further developed as they begin to brainstorm ways to create their invention without any written directions. This means each child’s creation will be unique, which I really love! Another aspect I really appreciated about this product are the short bios of several Black inventors introduced at the very beginning of the booklet, which we know our children don’t get to see often enough or ever in other STEAM products. Dream In Steam Is Perfect for Groups! Aquarius makes STEAM fun and affordable by showing students and families it doesn’t have to cost much money to create some pretty awesome inventions. 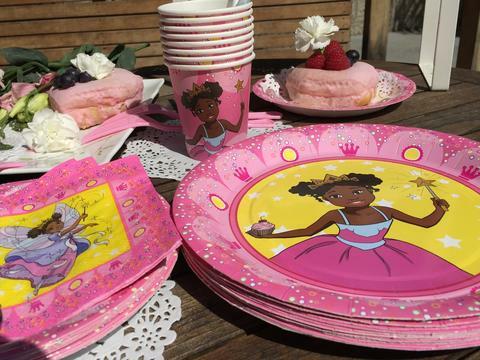 She intentionally uses everyday household objects that make it easy for kids to do the same projects over and over as they are likely to find the necessary materials at home or a local dollar store. In fact, after my six year old worked on creating his confetti launcher, we decided to repeat the same project during one of our homeschool meet ups with his friends by simply picking up some extra supplies. 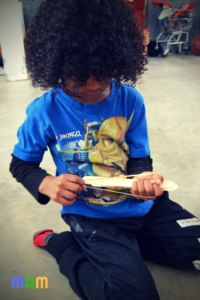 We had kids between the ages of four and eleven engaged and determined to figure out how to create a catapult to launch their confetti. Some children chose to work together and others worked alone. For those that weren’t sure what a catapult was, we did some research to see what they are and how they function, which gave them some ideas to begin planning their designs. Check out Zhaynah’s confetti launcher below, which took her about 2-3 trials before she perfected her design. 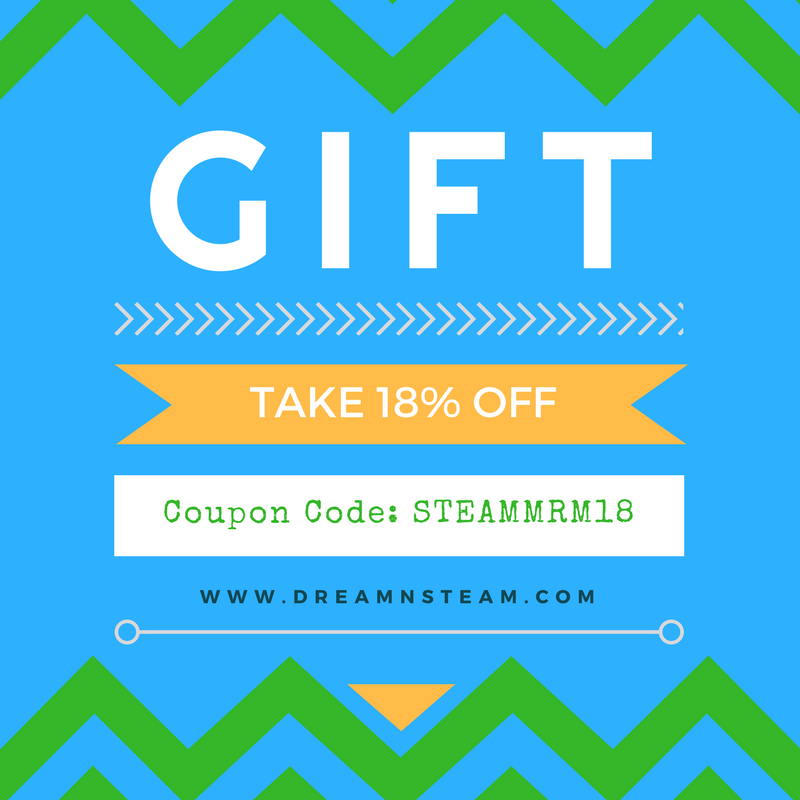 Just for tuning in today, you all get 18% off your first Dream In STEAM purchase! If you don’t want to commit to 12 months, you can always try one month with your discount code below. 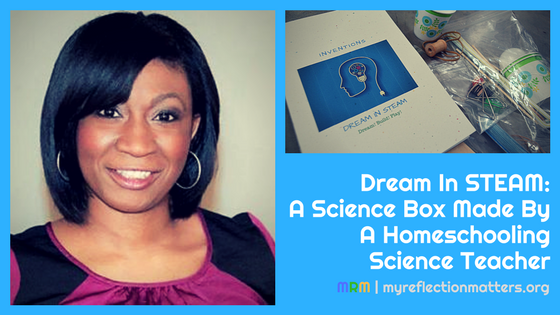 Make sure to comment on this post and share with us what you and your kids think about the Dream In STEAM box! Tune in next month to find out what the next themed STEAM box has to offer.